TERJUAL jual software paket belajar 16 bahasa, semua bahasa ada...super lengkap.. masuk gan! tekan ctrl+d dulu gan biar ga ilang. Beginners Japanese is a comprehensive language learning system that tailored to meet the needs of the novice. There are no phrases to memorize or verbs to conjugate. The language is absorbed gradually throught a series of self-guided and easy-to-follow lessons. Everyday Japanese is a self-paced language learning program, designed to make learning Japanese effortless. Simply point, click, listen and repeat what you have heard from a native speaker and before you know it, you'll be speaking another language. and kanji dictionary. Additionally, JWPce has a number of features that were designed to assist students studying Japanese. Didalamnya terdapat beberapa percakapan sehari-hari dalam bahas jepang..yang diperlihatkan dengan cara visual. Get feedback to move forward. You learn best by doing, and you' ll apply what you' ve learned to get to the next step. Rosetta Stone adapts to your individual needs and skills, because you drive the program with your progress. Start speaking immediately. From the very first lesson, you' ll speak. You' ll begin with essential basics, which form the building blocks of the language. Soon you' ll create new sentences on your own, using words you' ve learned. Best of all, Rosetta Stone is addictive. With every entertaining activity, you' ll feel success. You' ll want to use Rosetta Stone to have that next moment, that next breakthrough. So you' ll keep using it, and you' ll learn more! The most effective way to learn a new language is to be surrounded by it. When you were an infant, your parents taught you this way, by intuitively associating words with images. That' s the ultimate language lab, but most language-learning programs completely ignore this. Think about all of the ways you' ve tried to learn a language: classes at school, tapes and cassettes, even software that uses your native language as a base for your next one. What do they all have in common? Translation and memorization. Instead of taking a " direct flight" from your brain to your new language, translation and memorization connects you to your old language. You always have to " fly" from your brain, to your native tongue ... and then translate what you' ve memorized to communicate. That might work for a few words, but what happens when you get to a sentence or phrase? When you have to change tenses? You' re going to make a lot of " connecting flights." That' s why those other methods are so frustrating ... and why they fail. This method encourages you to think like a baby. You' ll pair words with vivid, real-life images and make connections between things you know and the new language. Soon, you' ll be thinking in a new language, stringing words together into phrases that you create. Rosetta Stone places this Dynamic Immersion method at the core of a suite of software that works with you to develop your skills. The simple, intuitive interface helps to keep you engaged in the solution, while advanced speech recognition technology makes certain that you' re speaking correctly and accurately. Best of all, Rosetta Stone never leaves you behind. You' ll only move forward when you' re ready, when you' ve become comfortable and confident. Communicate and connect with the world: Level 1, 2 & 3 Set. Rosetta Stone Level 1, 2 & 3 Set will take you on a journey from the basics to a whole new level of sophistication. You' ll build a foundation of fundamental vocabulary and essential language structure. You' ll quickly gain the confidence to engage in social interactions. Say " hello" and " goodbye, " arrange travel, order food, go shopping and more! From there, you' ll share your ideas and opinions, express feelings and talk about your life, your interests and more. You' ll discover a voice. In a new language. Develop your command of the language. From the simple to the complex, gain the confidence to share your ideas and opinions in German. Develop the conversational skills to plan adventures, care for your health and move abroad. Talk about government, work, movies, family, and more. Be able to fully express your ideas and opinions in German. Includes everything you need to learn German at home and on the go. * German pronunciation and spelling are regular and predictable. * There are three categories of German nouns: masculine, feminine, and neuter. * German nouns are always capitalized, regardless of where they occur in a sentence. For example: Der Mann l?uft. * Many verbs have two parts: one part that comes after the subject and one part that comes at the end of the sentence. For example: Der Mann hat einen Apfel gegessen. * The German alphabet contains all the letters of the Roman alphabet and in addition includes the letter ?. * The vowels in some German words have a mark written above them, a pair of dots called an umlaut ?. This mark shows you how to properly pronounce the word, and it may distinguish one word from another, which is identical except for the mark. For example: ein Apfel  zwei ?pfel. * German has both formal and informal ways to address others, depending on the age of the speaker and her relationship to the person or persons being addressed. Wondering how to make use of all that spare time on the plane while you're flying to Berlin, Hamburg, Munich or Frankfurt? Between your in-flight meal and your in-flight movie, try some In-Flight German! This 60-minute program is the simplest way to learn just enough German to get through anything you'll run into, whether you're traveling for business or for pleasure. Short lessons make In-Flight German easy to use. # Covers everything from greetings and polite expressions to asking directions, getting around, checking into a hotel, and going to a restaurant. # Includes sections for meeting people and spending a night on the town. # Over 400 essential words, phrases, and expressions. # Simple and effective format - just listen and repeat. Communicate and connect with the world. Build a foundation of fundamental vocabulary and essential language structure. Develop the Japanese language skills to enjoy social interactions such as travel and shopping and learn to share your ideas and opinions in Japanese. * Japanese is written with no spaces between words. * Learning to read hiragana and katakana is simplified by the fact that each character generally corresponds to a single syllable. * Japanese words change depending on the formality of the situation. Rosetta Stone teaches you to communicate in informal or formal Japanese, as appropriate for the situation. * Dont be surprised if you see sentences without subjects. The Japanese language often does not specify the subject. The meaning of the subject is conveyed by the context. * Nouns in Japanese do not change in the plural form. Instead, a number or counter before the noun indicates the quantity. A speech recognition system helps you practice what you have learned. But one of the best parts about using this product is getting access to forums and live chats with native speakers. It must be said that the chat options for the Japanese product are older and less useful than the options that come with Tell Me More products for other languages. Nevertheless, they are still quite useful for practicing what you learn. A big bonus is that it includes levels. It will take you from the beginning of your learning experience straight to the end. Many other programs are only for beginning users, making you pay more for the next step. Tell Me More doesnt do this. One other thing we liked is that it doesnt start off simple, but rather throws you into conversations from the beginning without wasting any time on useless introductions. It excels at helping you learn Japanese, and there are so many different methods of learning that theres bound to be a method that works for you. While this version we reviewed might not be as advanced as the other languages, it still surpasses the competition when it comes to getting the job done. This program has great features to help you understand and remember your vocabulary words and learn correct grammar. The set comes with a headset with a microphone to use along with some of the applications. The progress tracking feature is a great way to accurately catalog your progress and your performance. This feature is important because it helps you move through the program without confusion. You can see where you are in the program, what you have done, what you will be doing next and also what you might need to go back to. One great thing about this program is that it has lessons on both Hiragana and Katakana alphabets. This means that once you are done with the program you will not only be able to speak the language, but read it as well, which an essential skill if you want to be able to fully function in the Japanese culture. There are over 1,500 exercises included in this program with the potential for almost 300 hours of learning. The lessons of this program dont just cover vocabulary and grammar, but will also give you knowledge of the culture of the country by showing you native videos to give you a feel for the area. Something that might prove to be a slight problem is the learning paths. The order of lessons is fully customizable, but there isnt much structure regarding lesson order. It gives no direction on where to start, which is nice for independent learners but may be challenging for structured learners. One feature missing, which many of the other programs had, is a mobile lesson that you can download onto your iPod or MP3 player. However, the accuracy and effectiveness of the rest of the program easily made up for this shortcoming. This software covers all the fundamentals through a series of modules that teach vocabulary and grammar about specific subjects. The grammar lessons are less interactive than some other learn Japanese software, resembling a grammar textbook more than anything. This is offset by the speech recognition system where you can practice and refine conversations and pronunciation. This language learning software isnt as easy to use as it should be. There are a series of icons along the bottom representing different areas of the program, but they arent labeled well and its difficult at first to know exactly what you are clicking. The same is true for tabs or options within the activities themselves. Youll find yourself doing a lot of trial and error navigation at first, but once you get the hang of it, its extremely easy. There are a wide variety of teaching tools available. The standard uses a combination of images, voice clips of native speakers and text from the Japanese alphabets. The application punctuates this with the occasional video or culture lesson. This program has one of the most effective speech recognition tools, which will help you with your conversational skills by immersing you in real-life conversations. You can talk with a native speaker of the language and also hear a recording of your voice so you can hear how a pronunciation measures up. These practice speaking lessons are helpful because they help you feel more confident in speaking the language and give you immediate feedback on your accent. There is also an online chat program, which lets you practice what you have learned with native speakers. This product has one of the best selections of word tools you will find in learn Japanese software. It allows you to translate any word you see quickly and easily. This feature will be invaluable in the beginning when you are dropped in the middle of the language without any introductory lessons. It also has information about hiragana, katakana and kanji alphabets. Auralog, the manufacturer of Tell Me More Japanese, includes tutorials and user guides to help you learn how the program works. You can also contact Auralog through phone or email if you have technical issues with the software. Tell Me More Japanese offers one of the best and most effective speech recognition tools and online chats with native Japanese speakers to teach and refine your skills as you learn. Cultural lessons and educational videos round out this media-rich program. Be prepared for a steeper learning curve than the lower-ranked products, but once you've mastered the navigation, you'll it to be one of the most useful and engaging learn Japanese software programs available. Rosetta Stone combines vocabulary words with audio pronunciations, and pictures in a flash card format to teach English and many other languages. This is one of the easiest learn English programs to use. Just choose one of the five different sections and the software will guide you through a vocabulary list. The sections include Listening and Reading, Listening, Reading, Speaking and Writing. Rosetta Stone has 200 hours of instructional material; however, it doesnt have any word tools like a dictionary or word processing converter and it doesnt teach anything about the grammar of English. 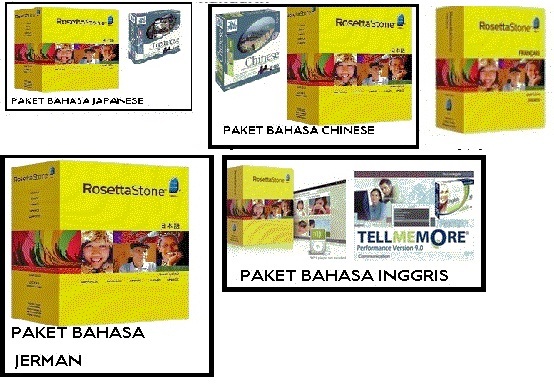 Rosetta Stone is designed for beginner, intermediate and advanced students. In addition, it teaches in many different languages. One of the standout features of this program is the record, playback and compare. In this feature, a native English speaker reads a word and the program displays the wavelength of the pronunciation. Then, you repeat the word and the program displays your pronunciation of the word. You can compare the two wavelengths and make any changes necessary to improve your pronunciation. Rosetta Stone has a comprehensive vocabulary section that is full of practical terms. Other fundamentals covered include writing, reading, listening comprehension and speech recognition. We were impressed with the speech recognition feature. It is easy to use and provides helpful feedback. The one fundamental missing that would improve this software is grammar. Grammar improves your ability to create original sentences and write fluently. Rosetta is easy to navigate with welllabeled buttons. We didnt have to use the tutorials to know how to use the program. Rosetta Stone uses the time proven method of flash cards to teach English. This is effective: however, we feel the program doesnt build a solid foundation of grammar. We didnt encounter any problems while installing and setting up the program. In order to use the record, playback and compare feature, youll need headphones and a microphone. Rosetta Stone provides good technical support to their customers. You can use the selfhelp options like tutorials, a user guide and other forms of online help or contact the customer support team by phone or email. This is a good program to build vocabulary. Rosetta Stone uses a lot of repetition and visuals to help you remember words and phrases. Nevertheless, it doesnt analyze or explain the grammar of the phrases.